©2009 Cherilyn SunRidge, detail-Balance. Acrylic, Poly-Vinyl, 12x31.5." Last week I “finished” the round altar floor canvas. Thrilling and exhilarating! It was gorgeous aspen flames against blue spruce kissing the sky, so the dogs and I gathered up for a dandy stroll. I kept my heart and mind open to any messages; They told me that the canvas needs the “star seeds” to be placed, coming down with potency and grounding energies. Returning home from our river song walk, I painted on the star seeds. 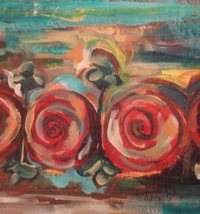 They are nearly minimal, nearly imperceptible; yet at that point the energies swirling around the studio relative to this painting, came to rest–now, the work was complete. Light-filled autumn to all beings. Creating on a circle is a thrill. 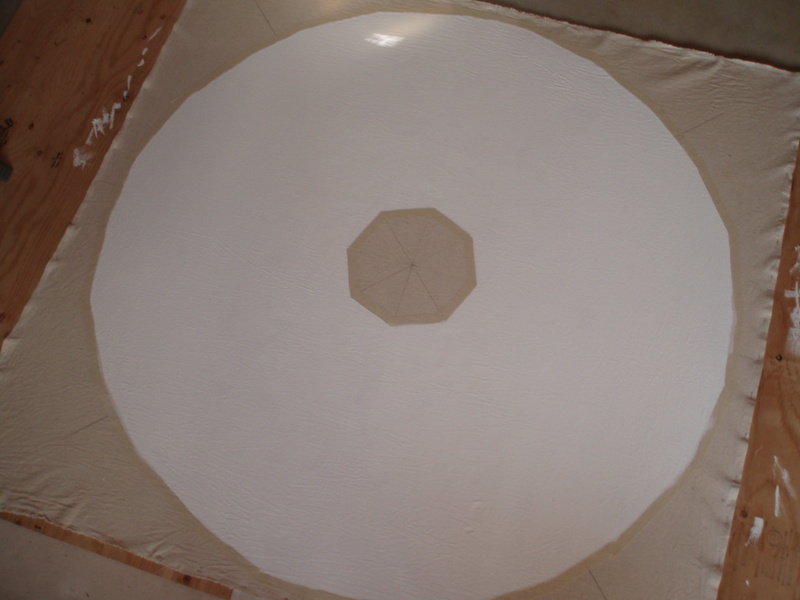 I have considered making round canvases for quite some time; I would still be ruminating if a collector had not requested “round.” I am grateful for the task. I walked sunwise to bring down messages. I walked earthwise to bring up messages. And the kiss of the cosmic forces with the earth forces gave images and directions and definitions. Now, I follow. For those of you in southwest Colorado! I am facilitating a plaster mask-making workshop on Sunday, 14 November. This is an all-day event, a soulful time to prepare for your winter and dark time of the year. My round thoughts are being replicated with my painting hand. 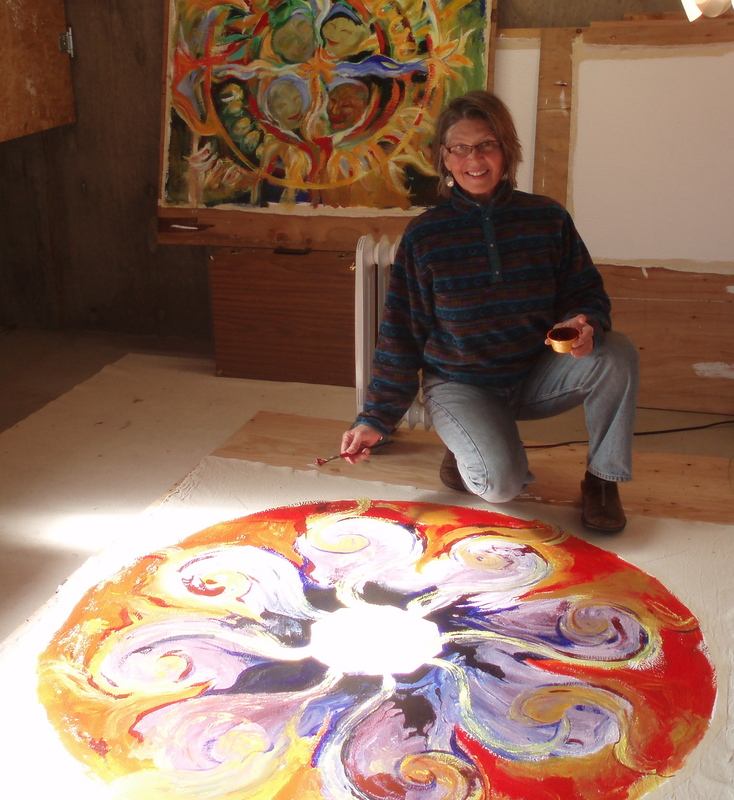 A commission from a teacher of healing arts and bodywork modalities in Los Angeles, California, has asked for “Round.” This collector wants an altar piece, for her students and her gatherings. There is a cutout in the middle for fire!!! Ah, hearth fires, candles, story time, healing time. Creating and painting in-the-round. I am so thrilled! Indian Summer in the San Juans has brought a ballet of yellow butterflies. They flit close to Earth, visiting the last of the wild flowers, some of which seem to be eternally blooming. As I walked gazing at the sky and tall pines, there was a butterfly above the Ponderosas; yellow against blue. Each time we gaze, we may see something “out of context,” dancing where we have not seen that particular dance before. I viewed an interview with Lennie Kravitz on SunDance’s Iconoclasts, speaking about acting, saying he hopes to “capture the essence, without imitating” of the character he is portraying. This comment bespeaks well of authentic art-spirit.